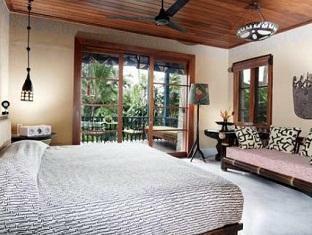 Looking for a different type of accommodation in Bali? Add Bambu Indah Hotel in Ubud to your bucket list, as you will not be staying in a tall concrete building with wallpapered walls, elevators, carpeted floors and cheesy live piano music in the lobby. A stay at Bambu Indah Hotel means staying in a traditional house made of bamboo and having a real back-to-nature experience in rural Bali! Being completely surrounded by paddy fields and jungles, you’ll feel as though you have entered Bali’s hidden natural heaven! The view of the light green rice paddy surrounded by darker green jungles is a very common view in Indonesia (particularly in Java and Bali), where the sun shines all year long on its very fertile lands. This is truly an ideal place for those expecting serenity and peace in a typical Indonesian environment. Bambu Indah Hotel has 13 rustic wooden houses for its guests, and like its name (Bambu Indah means beautiful bamboo in Bahasa Indonesia), all cottages are almost entirely made of teak and bamboo. These wooden houses are elevated from the ground and have thatched roofs. This is the traditional house style of Indonesia, and houses of this style can still be found in remote villages in the country, particularly in Java. It is a unique experience to stay in such a natural environment and traditional accommodation so close to a major city (it is only 10 minutes by car to Ubud). Amazingly, each house has a different theme, so if you stay for more than 1 night, you may want to consider asking if you could stay in different houses each night. If you stay in an Udang (shrimp) House for instance (I love this one! ), you will stay in a house with a glass floor. You’ll be able to see fish and shrimp living in the water under the floor. If you choose a Kuno (ancient) House, you will live in a house where the walls are made of woven bamboo! If you bring more people, stay in the 4-storey Pagoda House, in addition to the better view from the 3rd and 4th floors, there are 2 bedrooms on the lower levels (1st and 2nd floors) and you can always request extra beds for additional guests who stay on the 3rd and 4th floors! There are no TVs in any of the rooms and you will sleep in a canopy bed to prevent mosquito bites. Since you are completely surrounded by nature, you will also be able to listen to the sound of croaking frogs and chirping insects. This will make you feel as though you are sleeping in a totally different world, away from tall buildings and the sound of motorized vehicles! Each house has a private bathroom, which is as unique as the bedroom. Everything is made of wood, except for the mirror, wash basin and the closet. This is a semi outdoor bathroom, topped with a glass roof, but you are still able to enjoy the outdoor environment from inside the bathroom. Complimentary soap, shampoo and conditioner is offered to guests; however, different from those you get in any other hotel in Bali, they are organic, bringing you even closer to nature. Have a healthy bath! Swimming in the hotel’s swimming pool is a nice activity, especially if you bring your family along with you. At Bambu Indah Hotel, you shouldn’t miss swimming in the hotel’s pool, especially because you won’t feel like you are swimming in a swimming pool at all, but in a river! While swimming, you can listen to the sound of the croaking frogs hiding somewhere under the greenery and just like in a natural river, there is some moss growing on the pool’s walls. Here you can swim as long as you want without spending too long in chemicals such as chlorine, as the pool water is actually spring water channeled to the pool! In addition to that, there is a rope attached on a coconut tree, which you can climb up to (there are holes in the tree trunk to help you climb) and jump off the tree while hanging on to the rope before you finally plunge into the pool! You will have your complimentary simple breakfast buffet in the hotel’s restaurant Dapoer (kitchen), which serves the typical coffee, fruit, bread, salad, fried potatoes and some local foods. Don’t forget to try their bubur Bali, a savory congee that also comes with peanuts and vegetables. There are many vegan options, and in fact, they have one of the freshest salads in the world! This hotel has an organic vegetable garden and the vegetables used in salads and other meals are picked directly from the garden. Do you love watching the sunset? If you stay in a beachfront hotel, then the view of the sunset would be over the horizon, and if you are in a big city or a mountainous area, then you will enjoy seeing the sun disappearing from behind the city’s skyline or a mountain ridge. Well, at Bambu Indah Hotel, you will have a different view of the sunset, where you can enjoy the sun setting over the jungle from your rustic hotel. What a view! 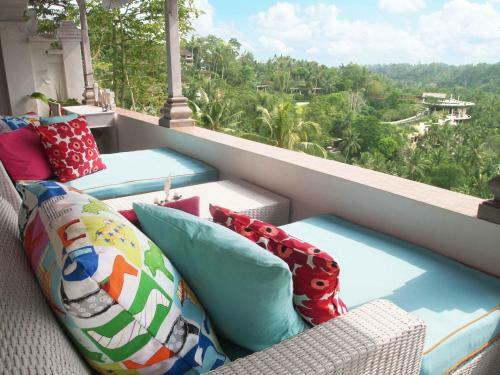 Rates range from 100 USD (1,311,000 IDR) for the Kuda House to 365 USD (4,785,000 IDR) for the Pagoda House. The eco hotel is just 10-minutes from Ubud’s center and for only 8 USD a day, you can rent a scooter from the hotel (make sure you have an international driver’s license with you). Remember that this hotel only has 13 houses and it is never lacking guests during the weekend. So, book your stay in advance before it’s too late!